This product is a Scrapbook.com Exclusive! 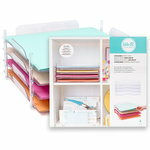 These Stackable Paper Trays are the ideal storage solution for 12" x 12" scrapbooking paper or cardstock. 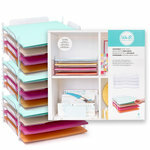 Each box comes with 10 stacking paper trays, made of a durable clear acrylic plastic which is strong enough to hold plenty of your heaviest papers and cardstocks.Â The new open (lipless) design makes it easier to get your paper or cardstock in and out of the trays even from the bottom of the stack. 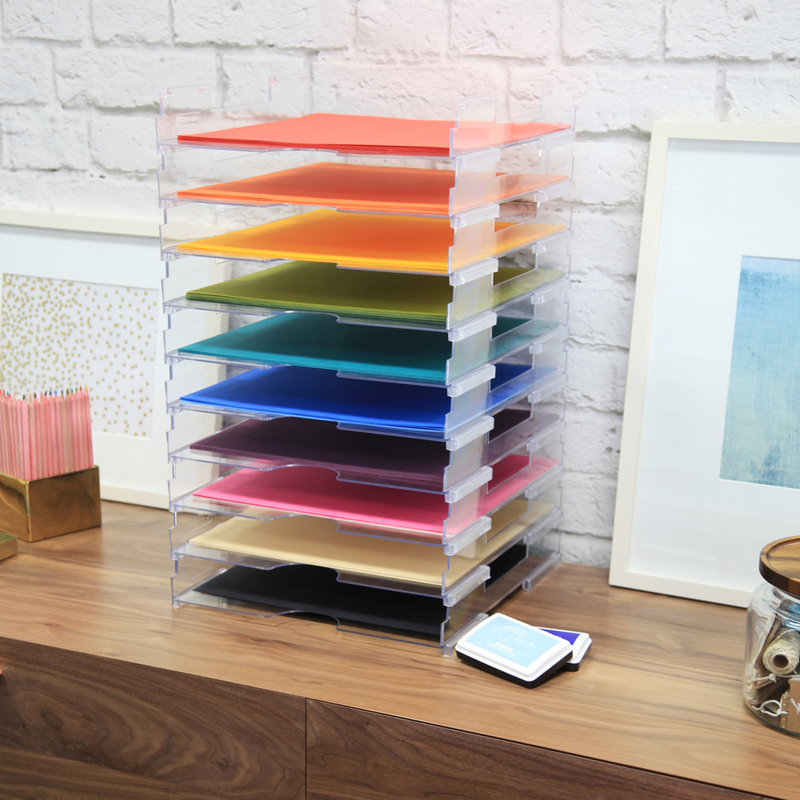 Â We use these trays here in our offices and warehouse at Scrapbook.com for paper and cardstock storage and several of our staff members use them at home as well. We're big fans of these paper trays around here. 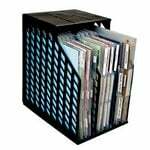 Try laying them on their side for vertical storage options too! Due to the size of this item, Gift Wrapping is not available. Note: This product is not available for customers outside of the United States. Note: This product is not eligible for free shipping promotions. I bought these stackable trays for two reasons: a) I needed something to organize my papers so I could see all my options, and b) someone posted pictures that showed that the trays fit perfectly into an Ikea Expedit storage unit. 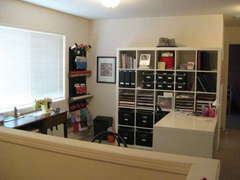 I completely cleared out my "craft room", set up the Ikea shelves, put in my newly bought paper trays, organized all my papers, and I am so thrilled with the results. The papers slide in and out with ease, the clear plastic design goes with any decor, and there is room on the top of each stack to sort my large scraps. I'm glad I bought two sets at once- this ought to last me for quite awhile. Used in this scraproom: My new paper trays! After having this product be out of stock for several weeks, I was thrilled to finally see it back in stock. If you're really into paper crafting, seeing these beautifully made trays filled with your favorite papers (mine is all things Bazzill) is a wonderful thing. 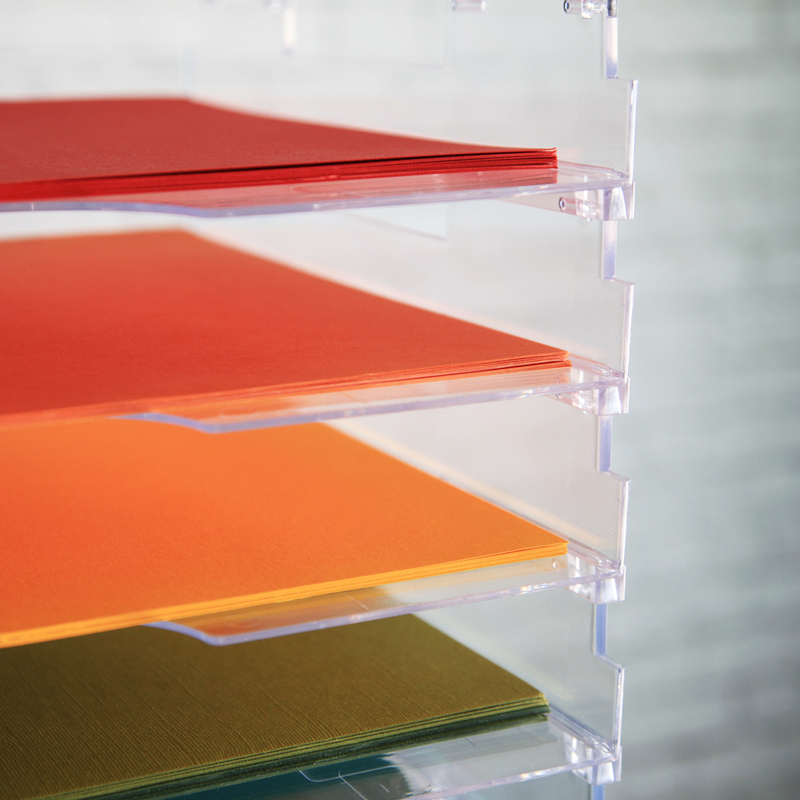 Display Dynamics trays are commercial grade quality; not your average flimsy little trays, so they will hold a huge stock of paper. I currently have 360 sheets of paper in the 10 trays and it will easily hold twice this amount. Be forewarned though...these trays take up a LOT of craft table real estate. That said, I'm very happy with my purchase! They were definitely worth waiting for until they came back in stock! OK, that may be a bit of an overstatement, but it's true about my scrapbooking paper since I got these trays. Over time I've probably tried every possible storage scheme, but this one seems to work. 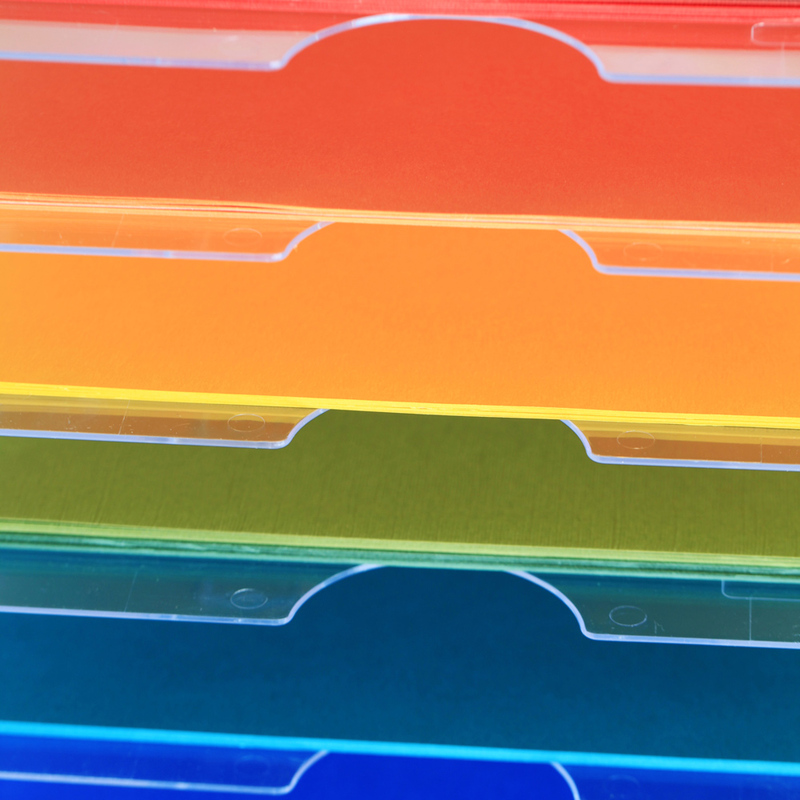 I have always stored my paper by color but more often upright in folders -- not so easy to see what's inside. With these trays it's quite easy to see what you have and get to what you want. And each tray holds quite a bit of paper. 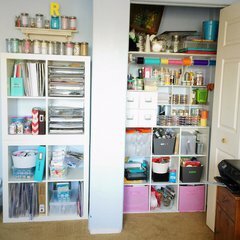 I put mine in two stacks of five trays each on a shelf in my crafts closet and that's working out great. I like them very much and with the dividers from the Cropper Hopper Paper Holders, prior to the latest offering, they work very well at holding different types of paper in the same tray. The only problem is that two of the 20 stackable trays, lipless, are cracked in the back and I am certain that scrapbook.com will make good on sending me two new ones in their places. Scrapbook.com did what they could to pack them well for shipping, but they must have been damaged in transit since both were damaged in the same place on the tray. I like the trays very much. Very thick material that doesn't bend easily. 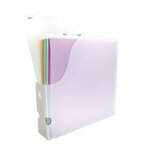 I have two sets of these in the 12x12 size AND the rolling base AND the drawer inserts - outstanding products!! I've had them now for almost 2 years and they have held up beautifully - VERY sturdy. I have my stack of 20 on the rolling base, which makes rearranging my work space easy and makes it super easy to put the whole stack right where I want it when I scrap. I highly recommend the product - it is well worth the money - takes up little space and provides a huge amount of storage in a small space. I read a lot of review but when I got this product I was convinced that all the reviews were right. I love these trays...I got the ones without the lip infront so it make it easier to pull them out and not damage the paper. 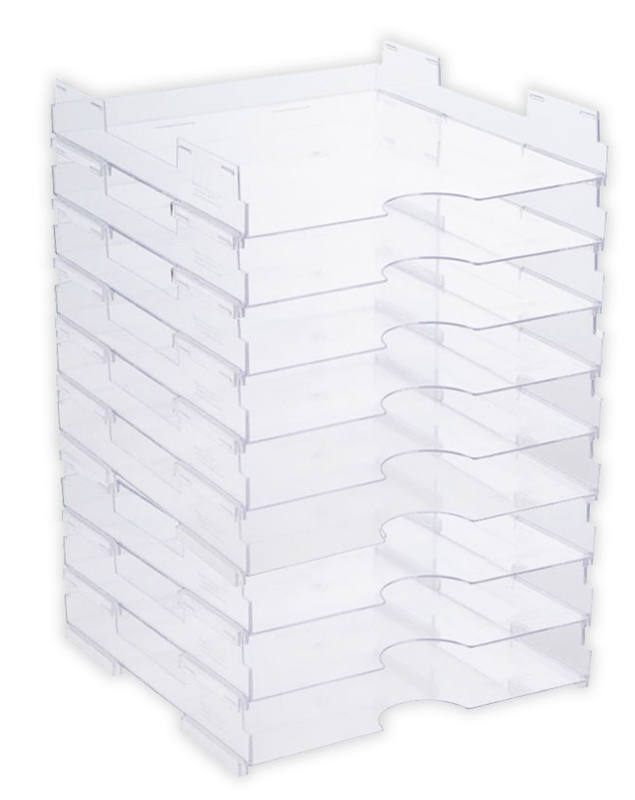 You can store up to six trays per cube. I love it. I am ready to place my THIRD order of these lipless trays. They are simply wonderful. 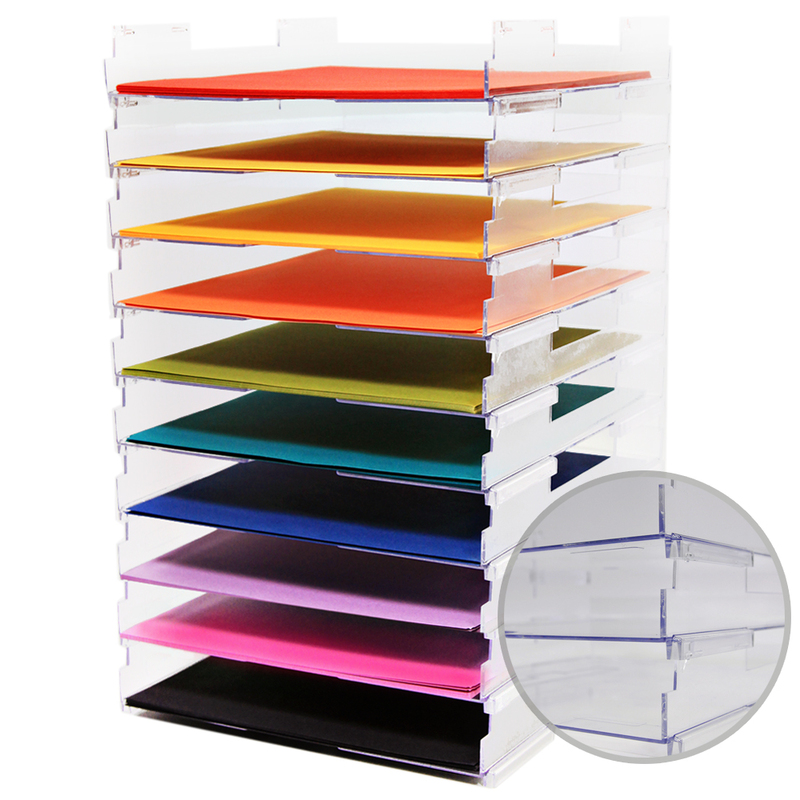 I have found these trays without the lips to be better for my paper storage because I can easily pull out my quantity of paper without tearing any of it. Since i have to lean over to access these trays, they are contained together to the right of my crafting space, I can grab an entire trays worth of paper and pull it out then return it accordingly. i also like the fact they are clear in nature. 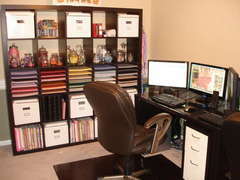 Since my craft room also doubles as a guest bedroom, the clear trays make a nice presentation on my desk. I have managed to fill up two sets of trays so will be ordering a third set very soon. I am presently putting all of one color in each tray so I can easily access a certain color. 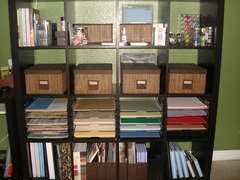 Then i also keep my color stock by colors in separate trays also. When I have more paper of one color than one tray will hold, as is the case with my blues and greens, I tend to put the heavier stock colors in one tray and the lighter stock of same color in tray above it. I have recommended these trays to many, including my one sister who is just starting to organize her room....she also intends to order some. Enjoy and i am sure you also will be a repeat customer for this wonderful product. These fit perfectly on the shelf in my scrapbook room. I made two stacks of 5 instead of one tall stack of 10. The lipless design is great because I can get to all of the paper, even the ones stuck on the bottom. I have my paper arranged by color (alphabetically by color name) -- black, blue, brown, green, orange, pink & purple, red, white, yellow, and then vellum. 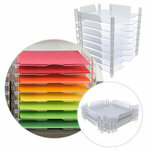 I ordered 2 10 packs of these trays for my craft room. They arrived in a timely fashion and look great in the Ikea Expedit. Unfortunately a few were broken upon arrival. I contacted Scrapbook.com that day and they immediately shipped out replacements. I was very pleased with the fast and helpful customer service. I will definitely be back! These trays are pretty close to 5 stars. They stack really well, hold a lot of paper and seem like they will keep their shape. My only issue is that 6 of the 10 I ordered arrived chipped, splitting or cracked, which was a major disappointment, because they weren't cheap. Having said that, I realize all the breaks were most likely a result of shipping, not in the way they were made. I would also like to give thumbs up to Scrapbook.com customer service who is replacing the broken ones!!! Not something you experience every day! Kudos to such customer care and commitment to excellent service!!! 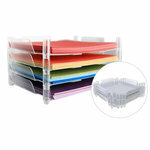 Does anyone happen to know if these paper trays will fit inside the cubbies of the IKEA Kallax bookshelf? Thank you in advance! By: slpotamus (04-Jun-16) Helpful Question? Yes | No Thank you! Report Inappropriate This question has been reported. Thank you! Yes! These trays fit the Kallex cubes quite nicely! By: Violette.Rose (07-Jun-16) Helpful Answer? Yes | No Thank you! Report Inappropriate This Answer has been reported. Thank you! Can the trays of 10 be stacked as 5 and 5? I have limited shelf height so I need to divide the trays into smaller "stacks" By: nerobertson (26-Aug-15) Helpful Question? Yes | No Thank you! Report Inappropriate This question has been reported. Thank you! Yes they can be divided into smaller stacks. By: Paula K (26-Aug-15) Helpful Answer? Yes | No Thank you! Report Inappropriate This Answer has been reported. Thank you! Why do some people choose the lipless over the lipped? I'm not sure which kind I want... By: amanda_souke (02-Sep-14) Helpful Question? Yes | No Thank you! Report Inappropriate This question has been reported. Thank you! The paper is easier to remove from the lipless but if the trays are going to be angled then the lipped will keep the paper from falling out. By: Paula K (03-Sep-14) Helpful Answer? Yes | No Thank you! Report Inappropriate This Answer has been reported. Thank you! Has anyone ever used these on their side? I prefer to store my paper vertically. By: User (25-Dec-16) Helpful Question? Yes | No Thank you! Report Inappropriate This question has been reported. Thank you! i don't own these but i was just reading in the (free) Jill Davis organization class on this site, that these tend to fall apart when turned vertically. She talks about it in the cardstock/paper session. By: Shirlc (06-Jan-17) Helpful Answer? Yes | No Thank you! Report Inappropriate This Answer has been reported. Thank you! What is the height of the 10 shelves fully assembled? Thank you. By: shelley5cl (25-Jun-16) Helpful Question? Yes | No Thank you! Report Inappropriate This question has been reported. Thank you! The set of ten I have measures just a hair over 21 1/2" when stacked as a single unit. I purchased mine several years ago so I wouldn't know if they are exactly the same as the shelves currently available. I really love them!! By: Greetings From the Farm (27-Jun-16) Helpful Answer? Yes | No Thank you! Report Inappropriate This Answer has been reported. Thank you! Could you fit the 12 x 12 Project Life photo sleeves in these or would it be too tight of a fit? By: BeverlyChristensen (18-Jun-15) Helpful Question? Yes | No Thank you! Report Inappropriate This question has been reported. Thank you! No. They do not fit. Very tight. By: Amber Boren (18-Jun-15) Helpful Answer? Yes | No Thank you! Report Inappropriate This Answer has been reported. Thank you! 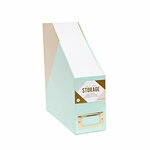 I've had my stackable bins & they are a good quality plastic & will hold lots of 12x12 scrapbook papers. 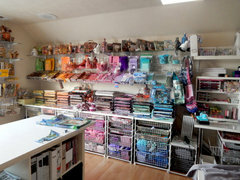 I have also put other craft items in mine. 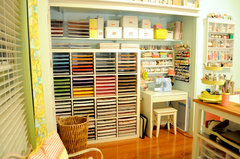 If working on a project, I'll store the project on shelve & craft area looks uncluttered By: marilynhon (25-Oct-15) Helpful Answer? Yes | No Thank you! Report Inappropriate This Answer has been reported. Thank you! How much paper can store in each tray? What is the weight capacity? By: ditsydi (11-Feb-17) Helpful Question? Yes | No Thank you! Report Inappropriate This question has been reported. Thank you! 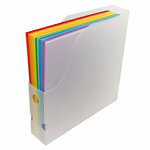 I do not have them at capacity, yet, but each should be able to hold up to 1 inch of paper up to 2 inches. By: setsged (13-Feb-17) Helpful Answer? Yes | No Thank you! Report Inappropriate This Answer has been reported. Thank you! Do you have a roller base that these can set on? I love these lipless paper trays. By: wordperfectqueen (18-Jun-16) Helpful Question? Yes | No Thank you! Report Inappropriate This question has been reported. Thank you! http://www.scrapbook.com/store/dd-st-007.html?t12-13=umbrella+crafts By: babykitty72 (22-Sep-16) Helpful Answer? Yes | No Thank you! Report Inappropriate This Answer has been reported. Thank you!